"This Is The Conversation Economy... and marketing is everyone's job," says John Battelle. 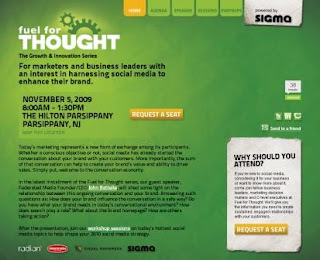 John Battelle, Founder, CEO & Chairman of Federated Media and author of John Battelle's SearchBlog, shared thoughts about the conversation economy during his keynote presentation for Fuel For Thought, the Growth & Innovation Series, a thought-provoking, intimate half-day session about social media marketing which took place in Parsippany, NJ, on 11/5/09. The era of packaged goods marketing has been eclipsed by conversation marketing [Read my post about Jonathan Salem Baskin and his 10 Ideas to Refocus Branding.]. As consumers, we distrust what we hear from corporate brands, preferring to form opinions based on the conversations taking place around us and online. In a conversation economy, every marketer is a publisher. Every publisher is a marketer. And every consumer is both marketer and publisher. Marketers can no longer push messages. Brand marketers can still control their website and paid links. Everyone else is in charge for the rest of search results. Which means that marketers must now pay attention to how customers and visitors behave online, how they increasingly gravitate towards search to find the information that they seek, and that they rarely start at your home page. Battelle characterized search as a 'database of conversations.' One where customers use natural language [think long tail searches] to find what they seek and that creates a linked economic system - think social search. How then is a brand marketer to market given the conversations? According to Battelle, all media can be social -- especially given the desire on the part of marketers to share. Magazines and TV create engagement and ads make sense given the context a reader is in. In the conversation economy, marketers require the skills of a publisher to succeed. They need to understand how to engage their audiences in conversation. It's a challenge because brands tend to be conservative and marketing tends to operate in a silo. To succeed, marketing needs to be everyone's job vertically and horizontally throughout an organization. Marketing is the business and everyone plays a role! If Web 1.0 was about marketing to constituents, Web 2.0 is about embracing the social media SEA and helping customers by filtering, aggregating and curating to create value and offer high quality marketing engagements. 5. When you're ready, dare to let the brand create conversation content! I love this point: think in terms of making media annuities - small, consistent contributions over time. Check out the examples John Battelle shared. In Open Forum from American Express, you'll notice an ad box where the viewer can choose to engage with specific content from well respected small business bloggers. Microsoft's ExecTweets offers an interesting destination [here is the Twitter Blog's post about ExecTweets]. Starbucks has been successful with My Starbucks Idea creating engagement and developing a community of passionate Starbucks customers. Metrics haven't been fully consolidated for measuring effectiveness. However, marketers want to identify amplification of the message, equity in the brand and whether engagement takes place. Here is Sigma's recap of the John Battelle presentation: Fuel for Thought Recap: All Media Is Social. Now What? Many thanks to Sigma's Jenn Kim, from whom I learned about the event which also included breakout presentations from Visual Goodness and Federated Media. [I missed the Radian6 and Sigma sessions]. 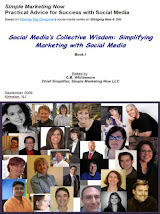 If you haven't already, would you consider subscribing to Simple Marketing Blog as well as becoming Facebook fans of Simple Marketing Now? Thank you!